The TEMPUR-Flex Elite is the top-of-the-line model in the Flex category, and a great way to go if you're looking for a contouring, yet firm overall feel. 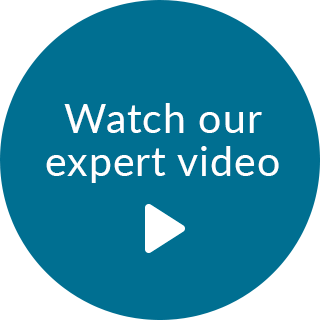 If you’re looking to enjoy all the classic benefits of a Tempur-Pedic hybrid mattress, as well as a softer feel, the Flex Elite is a great choice. Key features of the TEMPUR-Flex Elite start in the quilt with the zip-off EasyRefresh Top Cover, which you can easily remove to wash or replace. This smooth top quilt moves with you and the comfort materials so that the mattress easily contours the curves of your body. The SmartClimate System in the quilt feels cool and is designed to help keep you from getting too warm while you drift off to sleep. Another great benefit of this quilt is the antimicrobial treatment, which helps hinder microorganisms and dust mites so that your sleep environment remains clean and healthy. The first comfort layer, TEMPUR-ES material, provides a high degree of body contouring to ease pressure points and promote deep, restful sleep. The second layer, TEMPUR-Response material, works with the Dynamic Support Coil System in order to contour to the body, and at the same time, provide great overall support to the lower back. Because these features are not just supportive, but also highly responsive, the TEMPUR-Flex Elite has a springier feel. 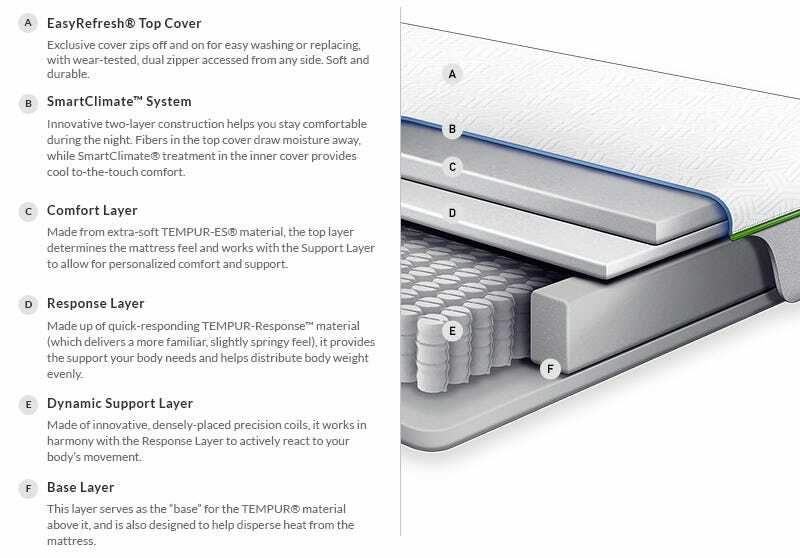 Overall, the TEMPUR-Flex Elite is a great choice if you want to experience the many benefits of a Tempur-Pedic, but also want the unique feel and support offered by a coil system. As far as hybrid mattresses go, this is one of the best on the market today for those with softer preferences. I Love my mattress and I'm so glad I got the base with the massage. They are amazing. Number one mattress without a doubt. I never sleep past seven. Now I can sleep until 10. If you like a softer comfort layer on a mattress but still want to have a supportive feel this is the bed! I've had my Tempur-Pedia mates for 1 year now. I enjoy sleeping on it as much today as I did the first day I got it. The amount of support it offers is great. I'm sleeping on it, not in it. The best sleep system I have ever owned. I wake up feeling refreshed and rejuvenated! I never toss and turn anymore or wake up with pain or numbness in the middle of the night. Very comfortable. Sleep like a baby! Soft but supportive. We did the split kings and are happy with our choice. This mattress is very comfortable. We love that it has the foam top, but the extra support of the springs on the bottom. It feels as though all your muscles are just relaxing as you lay onto the bed. I move a lot in bed and my husband cannot feel me moving around in the middle of the night. It absorbs movement. The thing I would probably recommend is going with the cool top though. We didn't and I feel as though it is a little warm. Not bad, but I notice it ever once and a while. It's the best night's sleep I have received in a long time! 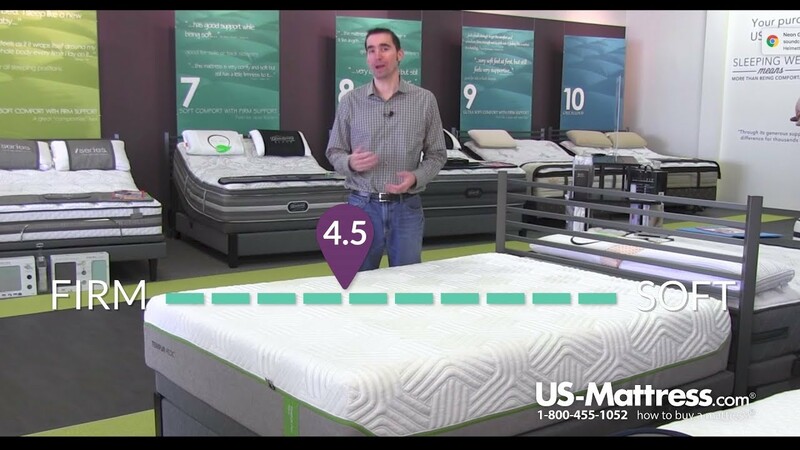 Yes, the split-king combo mattress was expensive, but how many hours do we spend in bed, versus how many in our cars? And look what we spend on our cars! Customer Service at Tempurpedic was excellent; my phone advisor was spot-on; the bed has made our lives healthier, happier and better. Thank you, Tempurpedic. PS: Buy your bed direct from them; you'll save $$. Never slept this good. Most cmfortable mattress. Best mattress I've ever owned. Very responsive and comfortable. Adjustable base is awesome. Great nights sleep. Other Hybrids don't compare. The flex elite is a wonderful combination of softness and support. I was a loyal Simmons Beautyrest customer for many years. I bought a hybrid Black model and found that the memory foam was slow to respond and gave the sensation of lying in a "dip." I guess there is a reason Tempurpedic is number one in memory foam. The difference is clear, and the flex elite feels really good. My husband and I both have back problems. Since we have owned this mattress neither of us have had any issues. It is amazing. We both cannot wait to get home to it after being away. Sleeping on this mattress is heavenly. Would highly recommend!!! Best of both worlds. Firm, yet soft and comfortable. This is my 2nd tempurpedic and I love it. This is a five star product Best mattress ever made ???? Dear tempur- pedic, When I slept on my new mattress the first time I was so happy no stress on my back or any of my joints I've had a few mattress in my day as I am 80 years in Dec.all my children have a set Got my first tempur- pedic 12 or 13 years ago--your guarantee is the best ever you sent me a new set due to a defect the first of this year no problems I can never thank you enough I love my new set Best service ever-- two sets same quality --wake up every day no pain -- no stress on my body due to tempura-- pedic???????? I was really hesitant about spending such a large amount on a mattress and essentially buying into what I thought was just a bunch of hype. I have to say though that this mattress has been wonderful to sleep on. Experiencing less joint pain, more restful and undisturbed sleep makes the hype pretty valid in my eyes. Of course the biggest complaint is the price which I don't think I'll ever get over. I wake up refreshed every morning. The fact that I can roll over without shaking the entire bed is great. most comfortable bed I have owned. love it so much! Couldn't be happier with our mattress! We can definitely tell when we haven't slept on it because we don't sleep as good. I would never buy another mattress besides this one! Seems like a good all around mattress. Softness of top level likely not for stomach sleepers, but seems to accommodate other positions well as deeper coil support maintains proper body alignment. Have had no issues with heat and I sleep hot. Offgassing for this model is much less noticeable than other brands. Foam rebounds quickly, allowing for fairly easy repositioning while still minimizing motion transfer if you sleep with a partner. Time will tell on durability, but given weight and hybrid support, should hold up well. Took a week or so for me to adjust coming from pillow top coil mattress, but I seem to be sleeping more comfortably as time goes. Only thing giving me pause is cost. They say you spend 1/3 of your life asleep, and with this mattress – I'm making up for lost time. My first night sleeping on a Tempur-Pedic was a "wake-up call" in the best way. I had no idea a mattress could make such a difference. My nagging back pain is nearly gone, and where I used to toss and turn, I am now soundly snoozing in seconds. I can't recommend a product more highly! Set your alarm and hop to it! Everyone needs one of these for a happier, healthier life. After suffering with shoulder pain for over three years and unable to get a full nights sleep, I am finally able to sleep peacefully and uninterrupted through the night. It conforms to my body and still gives me the support I need. Best decision ever to buy this mattress!! We have two mattresses now, king and queen size. My daughter loved sleeping so much on my queen size mattress that we decided to upgrade it to king and give her queen. Best money spent ever. Now my son wants one too. It is soft but not too soft so you get lots of support. You never get indentations from where you sleep. I honestly love to read books in my bed because of this mattress. We all own tempurpedic pillows and to top it off we even have 2 travel pillows. One downside is that you will hate to travel now because you will miss your bed. Big fan of your mattresses. Thank you. I bought a temperpedic mattress around 10 years ago and loved it it is now in the second bedroom because I bought another one and am enjoying my sleep even more. Great product and awesome sleep. I bought for our backs and got comfort too. We bought the flex elite because we wanted support for our backs. My husband likes firm and I like softer. Believe it or not, this makes us both happy and our backs feel great on here. The soreness in my shoulder left too. I love that it supports us but allows relief to sore spots . I also love the no movement in the mattress getting in and out of bed. If I ever buy another it will likely be a tempurpedic again but I would like to try the cloud series. What is there to lose with 120 days to try it out . I do not know which mattress model we have. We've had this mattress for about 15 years ... love, love, love it! Extreme comfort and support for my back ailments. I only wish we could take it with us when traveling. We also wish the cover had the more modern zip top for removal. I am an injured Army veteran and suffer daily from pains (many years of therapy!) I have recently purchased my second Tempur-Pedic (King) after owning my first (Queen - which I still have as a guest bed) for several years! I have had so many problems with SO MANY OTHER BEDS! Sleeping on conventional beds caused more pain than rest. Tempur-Pedic helps me get the rest I need! I have suffered through years of hip and back pain; the Tempur-Pedic mattress has been a lifesaver! We also included the ergonomic base and will never go without it! I can snuggle in and sleep like a baby, or if I have a cold and can't breathe I raise the head and sleep easier. Have never had that versatility before, and I'm loving it! Took a little while to get used to. Now I love it. it does not take me long to fall asleep since I purchased this mattress. I wake up nice and refreshed and no body pain! Unfortunately, I do not know which mattress it is. I've had this mattress for about 15 years, now and love, love, love it!! I only wish I could take it with us when we travel. I love the comfort and support which is crucial for my back issue. It is extremely comfort! I only wish that this mattress had a cover that had a zip top. Ours is under the mattress edge, which makes it impossible to get at. Love our Flex Elite split king!!!!! My husband and I used to sleep on a firm mattress. We added a 4 inch memory foam topper and it lasted us a while longer. However, I am a side sleeper and my fingers were starting to go numb during the night. Also, my hips and shoulders were starting to ache. Our bodies told us it was time to get a new mattress! We decided to give Tempur-Pedic a try for the first time and we are so glad we did! My fingers no longer go numb and my hips don't hurt. My shoulder pain is still slightly there, however, it is greatly relieved! We went with the adjustable base because my husband has terrible heart burn, reflux and snoring. On spaghetti nights, he has his head tilted and is actually able to sleep better without having reflux all night. When he is snoring and won't stop, I get his remote and raise the head of his bed. It may take a few times to get the right height, but he stops!!!!! We love our Tempur-Pedic Flex Elite and would highly recommend it to anyone looking for a better, more restful sleep! The only thing I would say is a negative is that,when you use the mattress protector, the mattress feels much firmer than without it. The protector does have stretch to it, however, for some reason it is still firmer feeling. WOW! 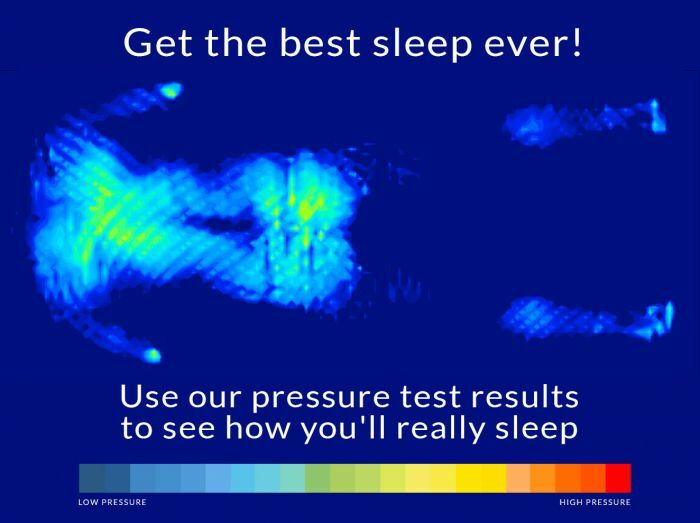 Now I know what quality sleep is like. This bed we bought ~3 months ago is AWESOME. We love the adjustable base which is useful when you've had a hard day's work. The Memory foam contours to our body perfectly giving support to critical pressure points. There is NOT a thing I don't like about our bed. This is a worthy investment. The only thing we missed out on is the free extra pillows due to deadline of promotion which we only missed by a week. There are no words to describe what it is like to sleep on this bed, except FANTASTIC!!!! I have suffered from chronic back pain for 20 years, and the first night of sleeping on this bed the pain was almost gone and within a week was completely gone. The bed is so worth the money! I can't think of one thing we don't love about the bed. I joke with the owners of the store we purchased the bed from and say the only bad thing about the bed is that I don't want to get out in the morning and go to work. Keep up the great quality of this mattress. This has been the 3rd tempurpedic we have tried and finally found the one. My husband and I both love it. This bed is rated on the softer side but is really on the firmer side. Very nice bed, perfect. We have back issues and would highly recommend it. Tempurpedic replaced another model for this one. Thank you Tempurpedic for going the extra mile! We purchased Tempur flex elite and Tempur-ergo adjustable base. We love it , I highly recommend the adjustable base, we could not live without it. I have acid reflux ,so we sleep with head slightly elevated and my wife has lower back problems, so we elevate feet slightly . This helps my acid reflux , her lower back and we don't snore as loud to boot. The only thing I highly recommend is whoever you purchase the adjustable base from have them open it up a day before delivery and have it air out . When coming out of box it has a strong chemical smell. We where not able to sleep in bed first night , smell gave us headaches. We love it and would highly recommend other than that.